Together with Fluency MC we have already published several interesting posts. In our latest post, we tried to help you teach 16 phrases with GET. And this time, there are 16 more. All the phrases come from the song by Fluency MC called GET A LIFE. And as the song contains many more phrases with GET there will be some more posts soon. 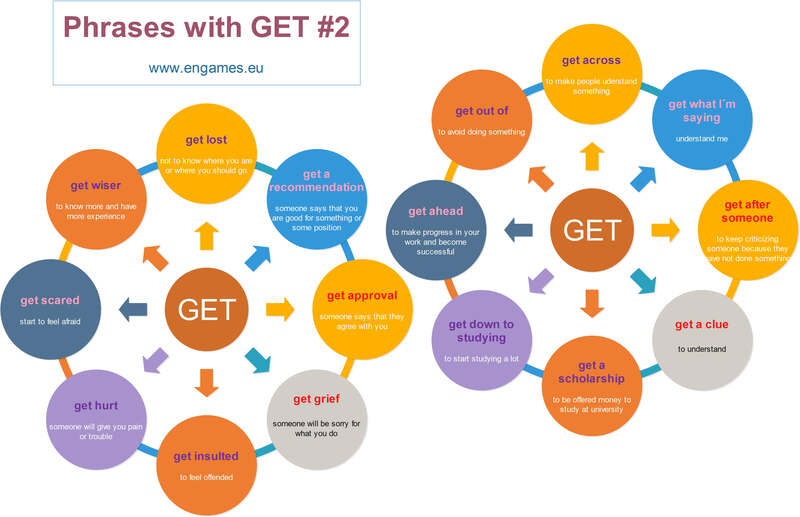 In this post, there is the song, an infographic and three games to help you teach the phrases with GET. As a starter play the song Get a Life to your students. All the phrases taught in this post can be found between 0:38 and 1:20. After introducing the phrases, move to the infographic. Display or print the following infographic for you students and go through the phrases with them. If you teach a monolingual class, it is a good idea to translate the phrases with the students. After you teach the pronunciation and the meaning of the phrases, it is useful to give your students about five minutes to learn the phrases on their own. After this, play the video again (from the beginning to 1:20) and let the students enjoy the fact that they can understand. The first game is just a simple piece of a drilling software. I call it Vocabulary Trainer. It displays a definition and your task is to write the phrase. Then the computer writes whether you were right or not. The phrases which you do not write correctly get repeated. Once you can see a zero twice it is the end of the game. I admit that it is not much of a game but I find it very useful when I learn foreign vocabulary. The second game is called Dice. You see a definition and your task is to type the correct phrase. If you succeed, you will see two dice and your task is to stop them. You get as many points as there are points on the dice. If both of the dice show the same number, you will get 10 points bonus. The best scores are saved. Good luck. The third game is called Guess the Length. Again, first write the correct words and then you will see a line. Your task is to guess how long the line is. The best scores are once again saved in a leaderboard.